Original cloth, without dust jacket. Rubbed, tear to hinge. Very good. FIRST EDITION. 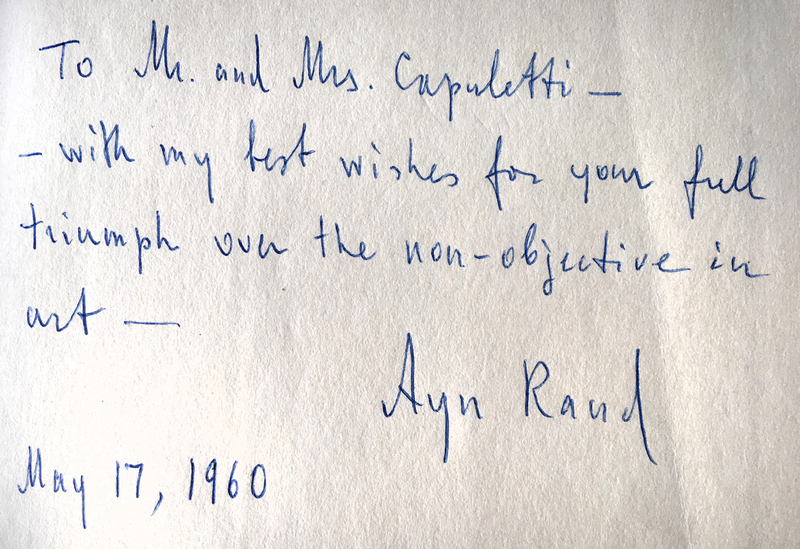 Inscribed and signed by Rand to Mr. and Mrs. Capuletti “for your triumph over the non-objective in art” and dated 17 May 1960. “The book made Rand a hero to many business owners, executives, and self-identified capitalists, who were overjoyed to discover a novel that acknowledged, understood, and appreciated their work … She presented a spiritualized version of America’s market system, creating a compelling vision of capitalism that drew on traditions of self-reliance and individualism but also presented a forward-looking, even futuristic ideal of what a capitalist society could be … Rand’s defense of wealth and merit freed capitalists from both personal and social guilt simultaneously … In Rand business had found a champion, a voice that could articulated its claim to prominence in American life” (Burns, Goddess of the Market: Ayn Rand and the American Right). NYPL Books of the Century 163.